After two hours of float tubing without a strike, the fish are suddenly surfacing everywhere. But before you can change to the right fly, your 32 oz. drink you had on the way up hits, and you have to go to shore. Solution? THE GLADDER BLADDER. The Gladder Bladder is the ultimate personal potty. 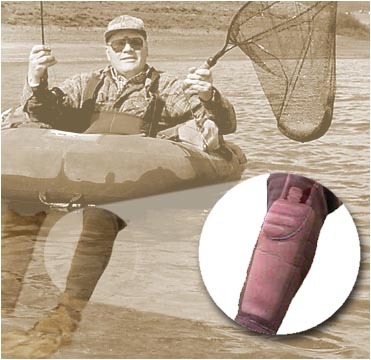 Worn under the waders, it's use eliminates the need to go to shore for relief. You now have more productive fishing time with much greater comfort. The Gladder Bladder also helps each one of us protect the lakes we love from unnecessary pollution. © 2001, Field Sports Solutions, Inc.